The plot of Inside Out is deceptively simplistic, though the execution is a brilliant balancing act between internal and external action. We are introduced to this internal world through a young baby named Riley, who has a collection of emotions affecting her behavior from birth. These emotions are Joy (voiced by Amy Poehler), Sadness (Phyllis Smith), Fear (Bill Hader), Anger (Lewis Black), and Disgust (Mindy Kaling). As Riley grows to be an 11-year-old child (voiced by Kaitlyn Dias), her emotions are put to the test with a life changing move from the Midwest to San Francisco. 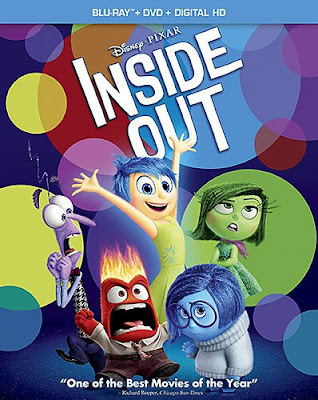 The premise of the film allows Inside Out to work on many different levels, not to mention the blending of a fantasy world with the realism Pixar is known for. The set-up of the film makes it fitting to blend these two styles, which previously seemed at odds with each other in past Pixar films. The most successful have always been the films which establish a hidden world amidst the familiar one, such as the life of toys when kids aren’t around or the monster world hidden behind the portals of closet doors. The subtlety of Riley’s behavior is contrasted by the struggle between the emotions in her head. After this big life change, the emotions suddenly discover that Sadness has the ability to taint memories which previously belonged to other emotions, such as Joy. In an effort to contain and control the emotions, Joy insists that Sadness refrain from interacting with the memories. This conflict results in Joy and Sadness becoming lost in the maze that is the brain, leaving the other emotions to cope with Riley’s struggle. The brain is treated like a factory of sorts, made up of different areas of core personality and long term memory. Inside Out cleverly adapts actual brain functions and activity into the film’s imagined world inside Riley’s head, while simultaneously using this environment to house the action for Joy and Sadness. There are some things about Inside Out that didn’t completely win me over, such as the strange decision to make all of the emotions in Riley’s parents’ heads a single gender. This gives us stereotypical gender behavior that contrasts the balance within Riley’s head. While the simplification may have helped move the story along with a few jokes, it leaves the impression that women sit around daydreaming about heartthrob men while their husbands think about sports rather than listening to their family speak. It also shows sadness to be the chief emotion in Riley’s mother, while anger is what controls her father. Aside from the fact that neither of these emotions are seen in the behavior of either character, this decision seems too reductive for a film as thoughtful as Inside Out. Though it may have been a way of simplifying the narrative to focus on Riley, it is frustrating to see gender treated in such a stereotypical manner merely for the purpose of a few cheap laughs. These gags and plenty more gender stereotyping make up the all-new short film as well, replacing the intelligence and warmth of the feature film. “Riley’s First Date?” focuses on the all-male emotions inside of Riley’s father’s head, as well as further damaging stereotyping in the blank mind of Riley’s teenage suitor. While Inside Out shows teenage girls to have an assortment of conflicting emotions with the process of growing up, the short film makes it clear that boys think about nothing serious by comparison. After the poor treatment of men characters in Disney’s Frozen, I am beginning to wonder if it is possible to have an animated film with a strong female protagonist without needing to oversimplify or make villains out of the men. Also included in the special features is the short film, “Lava,” which was included with Inside Out’s theatrical presentation. Other than these two short films, most of the special features included on the Blu-ray deal with the production process. There is a fairly generic making-of featurette, as well as ones about the personification of each emotion, one about the creation of the fantasy version of the brain, and one each for sound design and editing. It is also clear that Pixar was aware of the feminist agenda in the filmmaking process with a featurette only about the women of Inside Out.